I live in the Plateau part of Montreal, and we don’t own a car. We prefer getting around by foot, on bike or with public transit, and strollers did not give us the freedom we needed. With our first child, we used a front narrow-based carrier, graduating to a framed back carrier when baby got a bit heavier. A ring sling was also used, along with a BabyTrekker. Kid #1 enjoyed these carriers up until he was 2.5 years old. 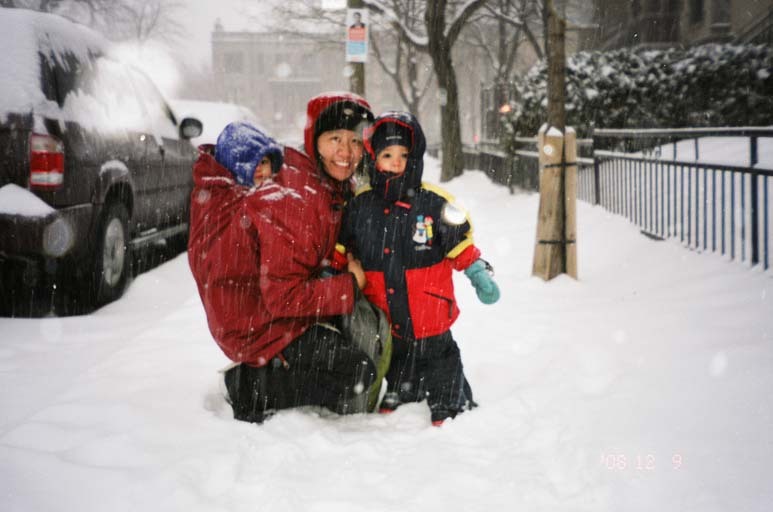 Our memories of going out with a stroller were punctuated by struggles with snowy, slushy sidewalks, the horrors of navigating narrow store aisles, and mighty challenges getting on a bus during rush hour and up and down broken escalators to crowded subway wagons. All this, when all I wanted sometimes was to have my hands free to do something useful! I discovered the stretchy wrap a few years later, with the arrival of our second child. Our firstborn was now an active pre-schooler, and I was ready to do anything not to get stuck with a stroller. 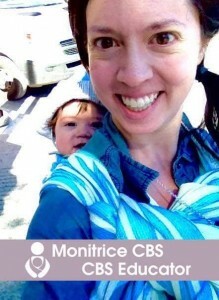 As Kid #2 got heavier, I discovered thebabywearer.com, and woven wraps and Asian-based carriers entered our repertoire. The learning curve for these carriers was not as easy as I had originally thought, especially when I began to wear Kid #2 on my back. There were no resources or a group of babywearing parents to show me the way. Thus Emporte-moi and Mamasupial Montreal (the original name for the Montreal babywearing meet-up group back in 2008) were started. I am delighted to have the opportunity to help parents and caregivers in and around Montreal to discover the joys of having their child close to them. Hello! I am a babywearing educator certified through the Canadian Babywearing School. I am a mother to two boys who were both worn since birth. One might think that my Vietnamese background explains the interest in babywearing, but it was actually through humanitarian work in Peru and Cameroun during my university years that I saw babies worn by their mothers for the first time. During a mission with Doctors without Borders and the Democratic Republic of Congo, I lived in villages where babywearing was part of everyday life and was a reflection of its origins which are probably as old as humanity itself. 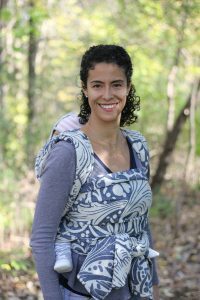 It is only when I had my own children that I realized that there were also physiological benefits to babywearing; they have been proven scientifically but modern medicine still does not know them very well. With Emporte-moi, I hope to bridge the gap between the practice of babywearing, which is becoming mainstream, and healthcare professionals. I would also like to participate in the normalization and babywearing safety and standards, so that this ancient art becomes once again the biological norm rather than than the exception. 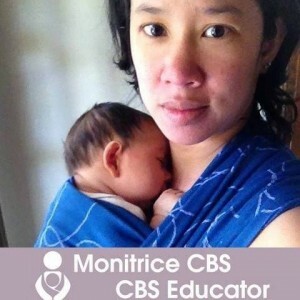 When I was pregnant I attended two different “babywearing” workshops in the same week. I was in awe of the variety of carriers available, as well as the endless possibilities of how to carry one’s baby. I saw my first back carry demonstration, and I knew that I would need to learn how to back carry, just as soon as my baby would be old enough! The first few weeks after he was born, I found myself walking the streets for hours, to keep him happy and help him sleep. It was a heatwave, so our ring sling was our best friend. We went on a little vacation and he could look around or sleep, snugly cuddled up against me, even during restaurant meals. When he got heavier, and the weather cooled off a little, I contacted Mai-Anh to learn how to front carry in a woven wrap. This started my addiction to wrapping my baby. Wrapping changed my entire experience of becoming a mother! 3rd floor apartment, no problem. No car and a frigid Montreal winter, no problem. Baby who is tired, but doesn’t want to sleep, no problem! In June 2016 I completed my level one CBS training. I am trained to give up-to-date advice on how to choose a carrier that fits your needs, and use it safely and comfortably. I am so excited to share the joy of using baby carriers! 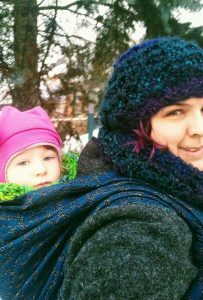 I am a mother of two and a babywearing educator by the Canadian Babywearing School. 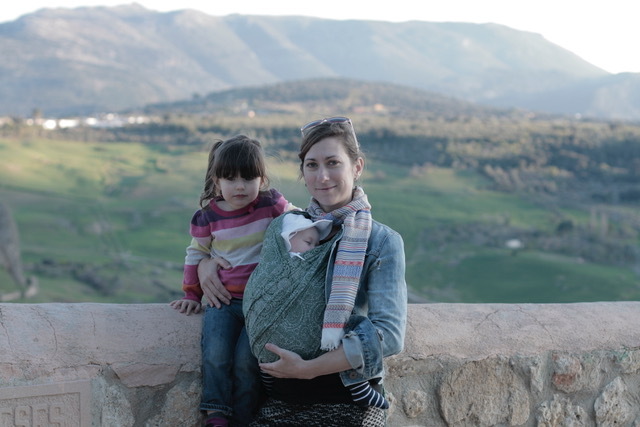 I have been travelling the world with my children for over 4 years and babywearing has been extremely helpful. Our family fell in love with babywearing and it enriches our lives on a daily basis. Babywearing is a passion that I love to share and teach to all families. I sincerely believe in its benefits and advantages and love to share tricks for traveling as a family. You can follow our adventures on our Facebook page Allez Hop Les Enfants! Let me introduce myself: I am a mother of two who discovered babywearing during my first maternity leave and who has caught the big. 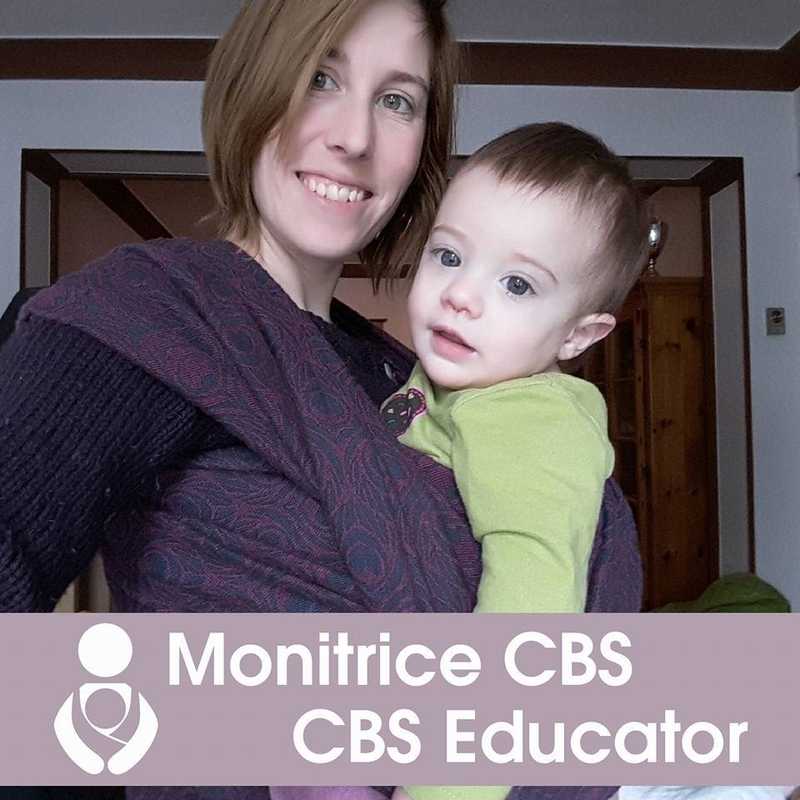 I completed my certification as a Babywearing educator with the Canadian Babywearing School in June of 2016 and I give various workshops on a regular basis since. I have a particular interest in helping families with babies with special needs to discover and use babywearing as a safe and effective tool for bonding. Whether you are a beginner or a seasoned babywearer, we are happy to help! Certified babywearing intructor with the CBS since 2015, I am a mother to two and babywearer since 2011. Like many wearers of that time, I’m self-taught at the core due to the lack of resources when I was learning. With babywearing becoming increasingly popular, I built a network of like-minded friends and I was able to explore this crazy world in good company. Now that babywearing is widespread, It’s my priviledge and pleasure to transmit to new enthousiasts – or perplexed parents – my experience, passion and knowledge gathered though the years on safe babywearing. When my first daughter was born, in 2013, I knew that babywearing would be an important part of my life. As International swing dance teachers, my husband and I were always on the go. 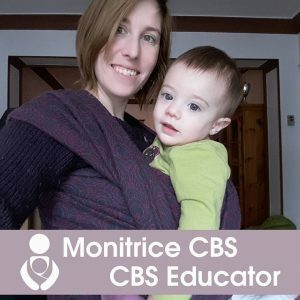 After having my second little bundle of love, I decided to get mhy certification as a babywearing instructor with the CBS in 2016. Sharing the beauty of babywearing and its benefits still amaze me every time.